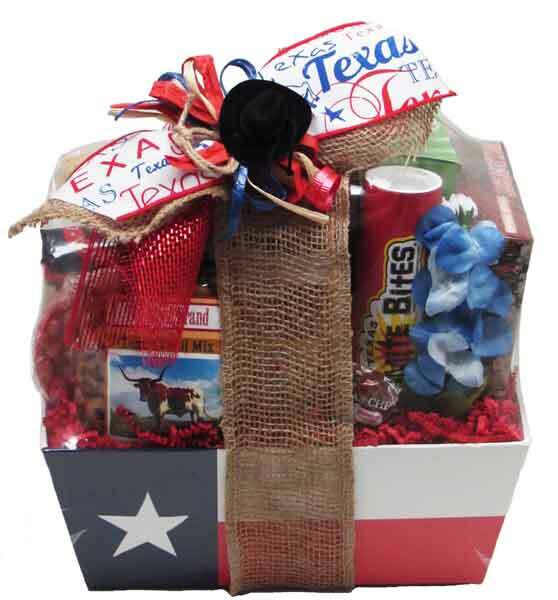 This is one good looking lone star flag container with Texas goodies inside. Makes a great keepsake! Box of Chocolate filled Wafer Cookies, box of Peanut Brittle, big bag of Texas Tortilla Chips, 16 oz. Jar of Salsa of course (Texas Caviar! ), savory Texas Trail Mix (photograph of a Texas Longhorn on the front and topped off with a felt cowboy hat, lariat rope, and a bow), Texas Oil Drops, two Chewy Pralines, Big Fudge Bite, and a Peanut Pattie (remember those?). We include a silk bluebonnet and a handwritten greeting card. 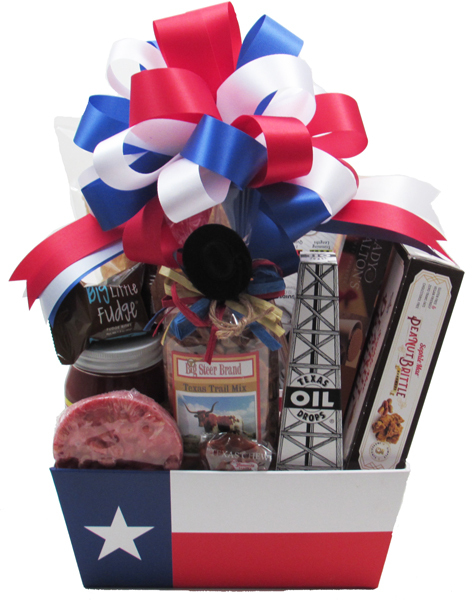 The Cookies, Tortilla Chips, Salsa, and Texas Oil Drops are from local Dallas area companies. The Peanut Brittle, Pralines, Fudge, and Peanut Pattie are from Texas companies. Wrapped and decorated for hand delivery approx. 16"h x 11"l x 8.5"w. For shipping, products will be designed lower in the container and the design will be shrink-wrapped with our signature enhancements on the outside of the shrink-wrap.